Proceeds from the song's iTunes sales are going to Abe's Garden care center. 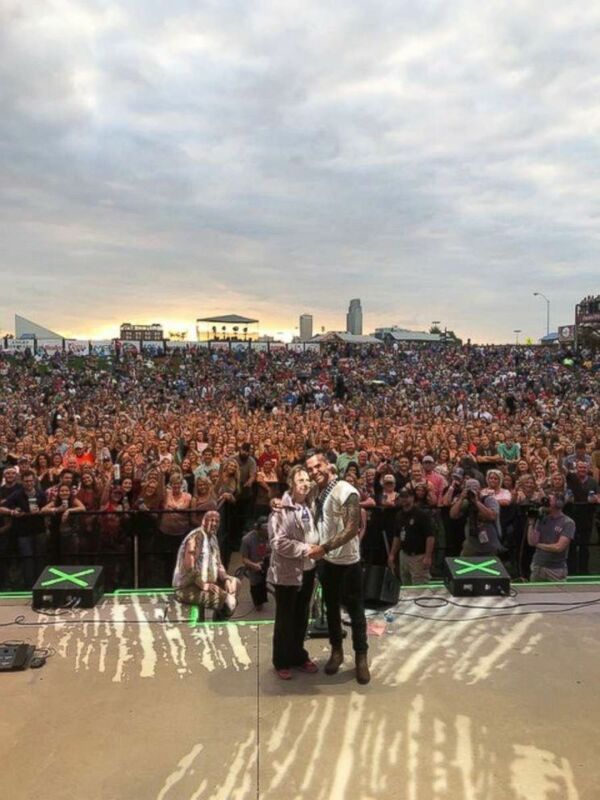 A country music singer who performed a song he'd written for his mother after she'd been diagnosed with Alzheimer's disease encouraged others to continue sharing a now-viral video of the concert moment posted on Facebook. "God gifted me with a voice and the ability to write songs, and I feel He gave me an opportunity through that to not only help my momma, but to use 'Blank Stares' as a tool to fight against Alzheimer’s," Jay Allen said in a statement to ABC News Friday. "This video going viral is proof that we have the ability to take something bad and turn it into something good. Please continue to like and share. From the bottom of my heart, thank you." (Jay Allen Music) Jay Allen gives his mother a hug. He performed his song "Blank Stares" recently with his mother by his side at the Dubuque County Fair. Proceeds from the song's iTunes sales are going to Abe's Garden, an Alzheimer's and memory care center in Nashville. 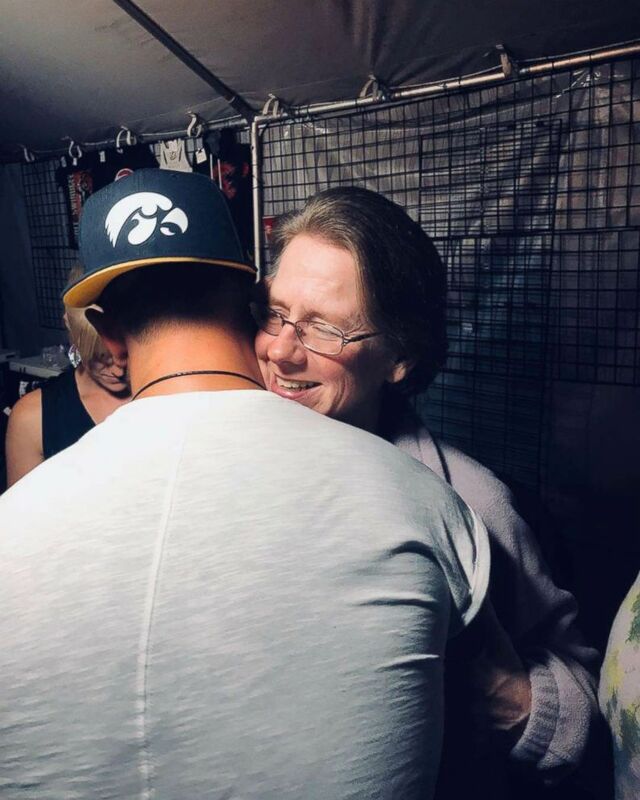 On July 27, Allen, a singer based in Nashville, Tennessee, was doing a set at Dubuque County Fair in Iowa when he invited his mother, Sherry Rich, to join him on stage as he performed the song "Blank Stares." When the song was released early this year, Allen said he'd written it with his mother in mind. "It's a song I wrote for my mother who suffers from early onset Alzheimer's at the age of only 53. She's in the final stages and doesn't have long to live, but I still find hope in the long goodbye," Allen said in a January news release. "My prayer is that this song becomes a mighty tool that ultimately helps end this nightmare disease." Lori Richard-Dittmer, who was in the audience Friday night, took video of the performance and posted it to her Facebook page Saturday. As of Friday, the video has at least 940,000 views. (Jay Allen Music) Jay Allen, a Cedar Falls, Iowa, native lives in the Nashville, Tennessee, area. A video of the performance was posted on Facebook and has at least 900,000 views. In the song, Allen says: "If I could only seal, the cracks your slipping through, wish I didn't feel so helpless, when it comes to helping you. ... You're still in there, deep down somewhere, I swear I still see you, between the blank stares." Alzheimer's, a disease that leads to memory loss and dementia, affects more than 5 million Americans, according to recent government estimates. On a GoFundMe page for Rich, the family said the disease had robbed her not only of her memory, but her ability to drive, work and talk. "For the past three years, our Uncle Pete (her younger brother), has selflessly been her caretaker. He moved from Texas and has stayed with her full-time. He has been a blessing to our family, but has recently made the tough decision to move back to be with his mentally ill daughter. ... As of June 1, our mother will be without care. Insurance won't provide since she's so young. And our father (Joe Rich) works 60+ hours/week at John Deere in Waterloo, IA - leaving him unable to be with her during the day. Local care, basically a daycare for Alzheimer's patients, is approximately $100/day, and care facility centers cost up to $5K/month. We can't afford either," the family said. Allen said that proceeds from the song's iTunes sales would "forever" go to Abe's Garden, a memory care center in Nashville, Tennessee, that he's chosen. 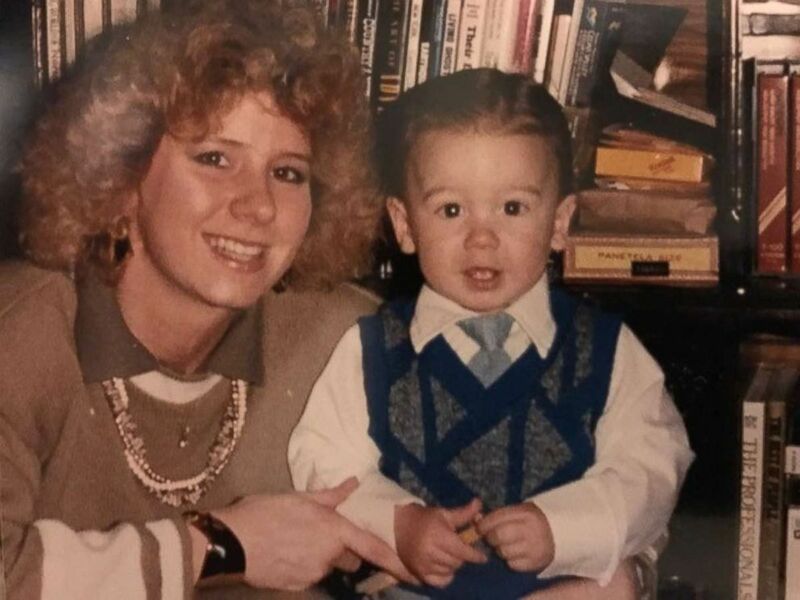 (Jay Allen Music) Jay Allen, a country music singer, and his mother, Sherry, in his early years. Allen is a country music singer. He is currently touring throughout the summer and working on new music.